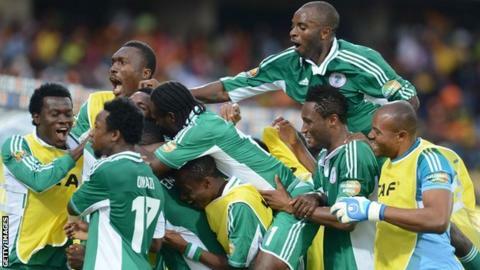 Nigeria progressed to the semi-finals of the Africa Cup of Nations with victory over favourites Ivory Coast. Midfielder Cheick Tiote drew the Elephants level shortly after the break, heading home from Didier Drogba's free-kick. But Sunday Mba sealed Nigeria's win with a shot deflected in off Sol Bamba. The result sees Nigeria through to their fifth semi-final in seven Nations Cup appearances, while Ivory Coast's wait for a second continental title goes on, after they failed once again to live up to their billing as the highest-ranked side in Africa. It also marks a return to form for two-time winners Nigeria, after they failed to qualify for last year's finals in Equatorial Guinea and Gabon. Nigeria were much the brighter side throughout the first half, with the star-studded Ivorians looking lethargic. Chelsea's Victor Moses led the Super Eagles' attacking threat from the outset, sending in a searching ball that Ideye Brown was unable to direct on target. Moses then sought to add to his two-goal tally against Ethiopia, lashing in a fierce shot from 25 yards that stung Barry's hands, before trying to find Brown at the far post from a free-kick that flew just over the striker's head. The Elephants struggled to get a shot on target in the opening period and were largely limited to long-range attempts, with Tiote's snapshot flying over Vincent Enyeama's bar. Emenike had had the best chance of the opening half-hour, Brown playing in the Spartak Moscow striker only for him to lift his shot over, but he was on target when Nigeria took a deserved lead on 43 minutes, thumping home from 25 yards from a short free-kick. The Ivorians almost replied from a dead ball, Romaric whipping in a curling shot that flew just over Enyeama's bar, but the tournament favourites went in at the break with work to do to get back into the contest. They emerged much brighter and hauled themselves level on 50 minutes, profiting from a fortuitous free-kick after Drogba went down under minimal contact in a dangerous position. The former Shanghai Shenhua man chipped to the far post, where Tiote headed home his first goal for his country as the Nigerian defence failed to pick him up. The goal spurred the favourites on and they pressed the Nigerian defence looking for a second, which almost came when Enyeama flapped at a corner and the ball fell to Tiote on the edge of the area, but it was cleared well. At the other end, Brown squandered a great chance to head home at point-blank range from a corner, but Barry gathered after a brief scramble in his six-yard area. Still the Ivorians threatened, Yaya Toure bursting to the edge of the area and smacking a shot straight at Enyeama, who parried away, with Drogba unable to get his follow-up shot on target. But it was the Nigerians who edged ahead, as Mba broke to the edge of the area and unleashed a fierce shot that deflected wickedly off Bamba and past Barry. Elephants coach Sabri Lamouchi responded by throwing on Lacina Traore for Romaric and the big striker found the ball at his feet in front of goal almost immediately but was unable to get a shot in, allowing the Nigerians to clear, as they hung on to progress to a semi-final clash with Mali. "I sincerely thank my players for everything they did today. I hope we can keep going to the final. "Ivory Coast are the top team on the continent with lots of quality, so we tried to speed up and try to catch out players like Drogba and Yaya Toure. "I'm glad my team is progressing in every game. There is great discipline in the team and I just hope we keep going that way. "The boys showed character. When the Ivorians levelled we tried to defend and work out our tactics, and we scored again. Sunday came up with a beautiful, beautiful goal." "I'm proud of my players' work. I put forward the team I judged to be the best to pose problems to a good Nigeria side. "Of course our aim was to win the title and for certain players this could be their last chance so, yes, there is disappointment in the dressing room. "It's a great sadness for me as the players were working with one objective - to win this Nations Cup - but it proved not to be enough."